Widget version of Triple Yahtzee dice game. Is there a better alternative to TripleYahtzee? Is TripleYahtzee really the best app in Internet Utilities category? Will TripleYahtzee work good on macOS 10.13.4? 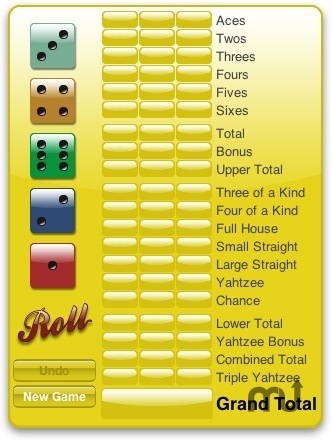 Triple Yahtzee is a widget version of the normal Yahtzee dice game, but you have three chances to score each category. The total score of each column of categories is multiplied by one, two, and three respectively. Try to keep your highest score for each category in the third column for a better score. Top 10 high scores are kept. Classic "single" Yahtzee version available (with its own set of high scores). More features to come if I get some feedback, and people are interested. This is my first widget, hope you enjoy. TripleYahtzee needs a rating. Be the first to rate this app and get the discussion started!